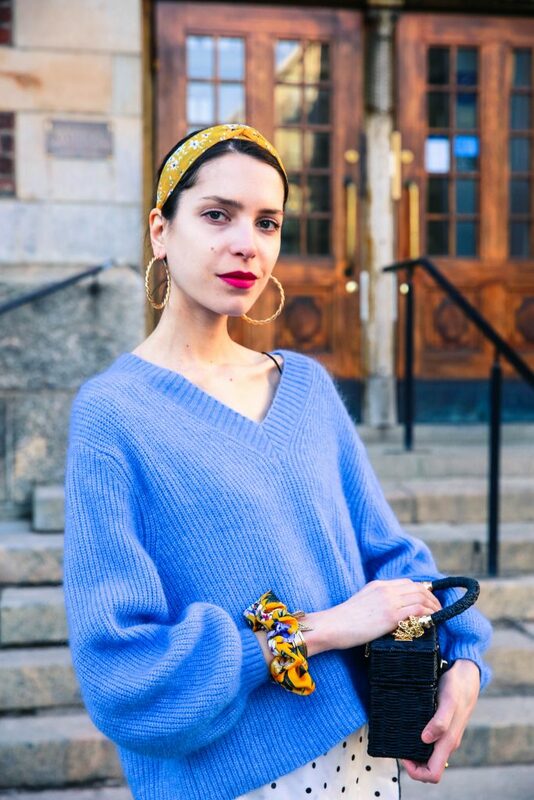 If you’re wondering what are the 3 big trends for this Spring, I got the answer right here: polka dots anything, basket bag and hooped earrings. I have decided to incorporate all three of them in my latest outfit. There are many trends which fashion magazines and platforms are predicting but those 3 are my top favourites for this Spring. 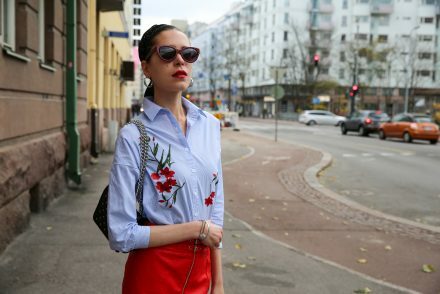 As the Spring has been slowly but safely making it’s way to Helsinki too, I have been thinking and buying some new clothes to refresh my closet. I’m excited about wearing lighter more colourful clothes. 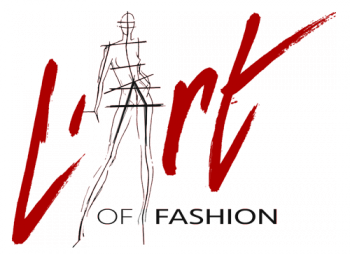 Transitional wardrobe might be bit of a challenge but it’s also a great opportunity to play with the “best of” from your Winter wardrobe in combination with the new Spring time additions. 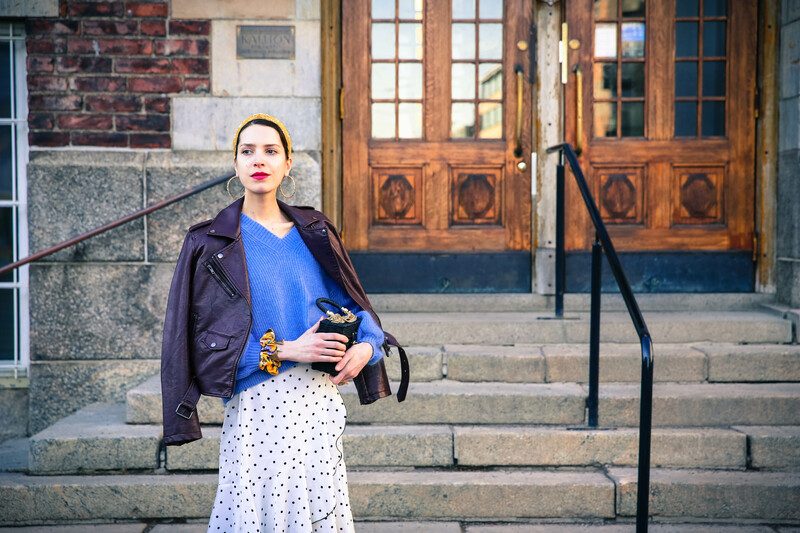 That is exactly what I did in this outfit pairing my “new in” polka dots skirt with a bright, oversized sweater which has kept me warm during the colder days. What are your top 3 favourite trends for this Spring? Which kind of items are your must haves? I hope that your Easter holidays went well and that the beginning of April started smoothly. I had couple of just really chill days, mostly at home, resting, cleaning and organising myself for the month ahead. I’m guilty of multitasking and overloading myself with different tasks and work way more than I can handle, so no wonder that I often feel overwhelmed and feel like I can never get everything done. It’s truly eye opening how much slowing down and taking time to just be focused and present in the moment can help you get things organised and done. Even though celebrating Easter isn’t the same as back at my old home country where my siblings and parents live, I did wanted to do something more special than just be at home and organise so I did go for a nice Easter dinner with a friend and for a long walk by the sea with my daughter. The sun is shining today and my mindset is positive of having a great and productive week ahead. I love this look, the styling is incredible !! You are really elegant and chic. The outfit is so cute. I love the blue sweater. I always love your styling. I like everything about this outfit and you always look so lovely and gracefully. I can’t believe this is the third time today I’m commenting about the color yellow – but I really do love your little pops of mustardy golden yellow in your hair and on your wrist. After seeing this, I think I could also try a little yellow scarf headband in my hair – I’ll let you know how it turns out! Oh wow, I love the look! I’m just about easing into the idea of polka dots – I think they are such a cute trend for spring and I love the yellow! Love the outfit and styling. 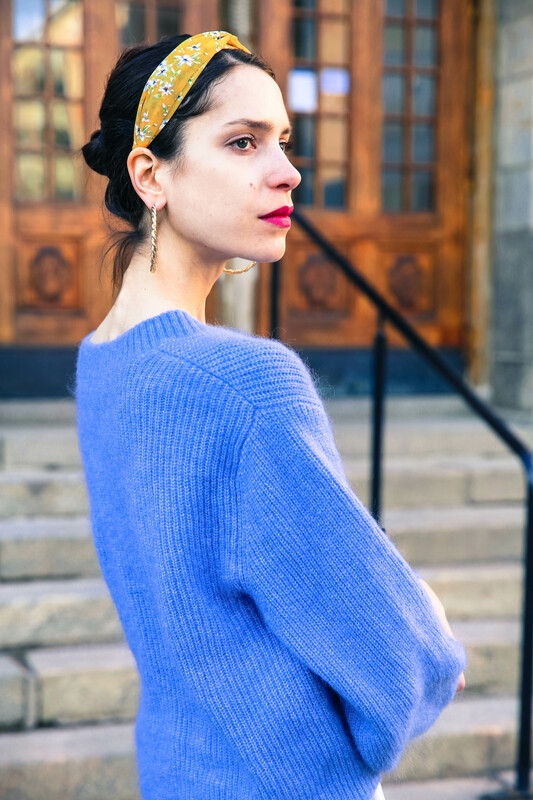 I always enjoy wearing fabric headbands in spring and summer time. Totally in love with the skirt! Loving the color combo on this outfit! Great post, and I love your polka dot skirt!! I am totally on board with all of those trends, especially the polka dots. Love those shoes, by the way! predivna kombinacija! Torbica i cipele su savršene. You are so chic! Love your shoes! I absolutely love this look and I love the skirt! That polka dot skirt is so fun! I love it paired with the bright blue! I love these colour blocks. So pretty! We’ve been living in Nashville for six months now, but there is still so many areas we haven’t explored. I’m loving all the contrast in your outfit! Beautiful thoughts & love ♥️ the casual stylish look! The Headwear-baseball hat produced by Tuory has a fashionable style, better quality, and lower price, and is the best choice for promotion activities. Both men and women can wear, size can be adjusted, you can adjust the metal buckle behind the hat. Comfortable and stylish. 100% cotton material, you can also provide a logo image, we will print logo, silk screen, thermal transfer, sublimation, rubber; plane / 3D / patch embroidery logo printing and so on. Our Private label Time Release Vitamin C capsule can supply Vitamin C to your body in optimum ways. It is especially needed when you are under the condition of fatigue. Vitamin C plays various roles in human body but it cannot be synthesized by itself and hence has to be supplemented by taking fruits and vegetables. However, you cannot keep water soluble Vitamin C over long time in your body. This capsule allows vitamin C stay in the body over a long time by releasing it slowly. It is extracted from fruit clip of the wild plant “Macleaya cordata (Willd.) R. Br”, also called as “Pink Plumepoppy” in China. The whole plant contains many benzo-c-phenanthridine alkaloids: Sanguinarine (pseudochelerythrine), chelerythrine, protopine, α-Allocryptopine, β-Allocrytopine, bocconoline, sanguirtrine, oxysanguinarine, dehydroeicanthifoline, dehydroeicanthifoline, bocconoline, berberine, coptisine, corysamine etc. Although this is my first time to see this bag, you look very nice. 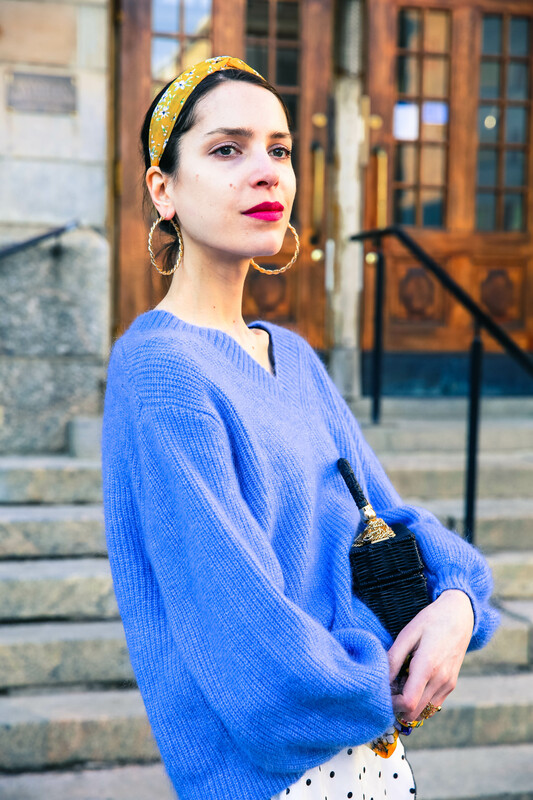 You look so lovely and classic with your yellow turban and loop earrings! Your style is so fabulous.